SOLUKHUMBU, March 9: The Cho-La Pass at Khumjung in Solukhumbu is becoming riskier in lack of adequate infrastructure. There are not even arrow boards showing directions in this area which is covered with snow year round, due to which foreign tourists lose way and their life. 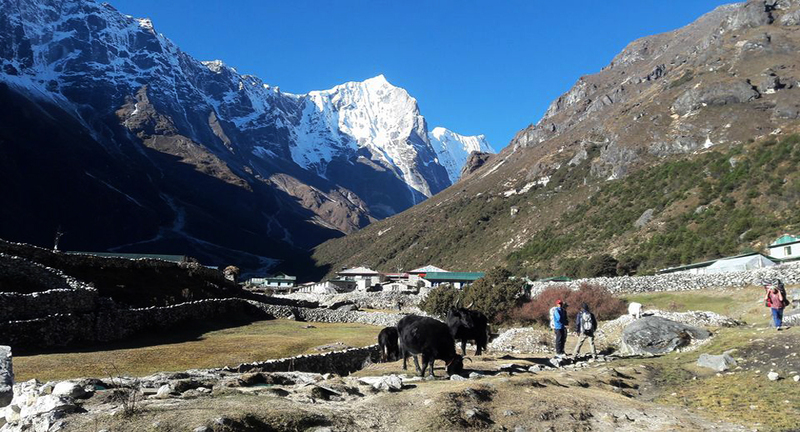 The Cho-La Pass is on the way to the Mt Everest base camp from the Gokyo lake, one of the famous tourist area in Solukhumbu district. Located at an altitude of 5,420 metres from the mean sea level, Cho-La Pass is considered one of the most risky in the district. More, the trail leading to the pass is not in good condition. Tourism entrepreneur Mingmar Sherpa stated that there is no trace of the trail on the snowfield as the topography keeps on changing due to the annual global warming. The route in the area has become more treacherous due to the glacier melting and the formation of glacial lakes and crevasses, he added. Some of the foreign trekkers and climbers visiting through the Cho-La Pass have gone missing as the track is covered by the snowfall. The pass is dangerous for the visitors as they have to cross mounds of snow, said tourism entrepreneur Ram Bamjan.